Well, it was cruisy and fun for the first 45km and then it became hard and fun. Rolled up to Fed Square at 7am to find nikcee and tom waiting. We hung around a few extra minutes and LAM turned up too. Turned out to be a nice little group. We hit the road and got our first taste of dirt at the Ghetto Cross track. Awesome course! The gnarly steep bit at the start/finish line is going to be carnage. (bummed i'm going to miss the race - i'll be at Uluru when it's on) From there we headed out to Burke Road and hit the Yarra trails all the way out to Westerfolds Park. This was wicked fun as usual. The trails were dry and fast for a change so we got through there pretty quick. LAM hammered it on 23mm Gatorskins and this was nikcee's first ride on his new Basso cx beast so it was fun all round. There may have been a few minor offs and tom had issues with an exploding saddle bag but we made good time and sent many rabbits running for cover. Pretty soon we were rolling into Eltham where we made a quick stop for sunscreen. The weather was gorgeous - clear blue sky all round and the temperature was rising. Skin cancer = not good. From Eltham we clicked into roadie mode and climbed out through Research and then Kangaroo Ground. The first hills of the day. Sitting and grinding and then spinning down the other side. All good fun. Then we turned off the main road and that's when the real fun started. Hills. Steep hills. The road was still paved and there were virtually no cars around so we were bombing it down empty roads, spinning as fast as we dared. The long fast run down to "Bend of Islands" was magic. Good road surface, no traffic, just caning it and thinking "Should I brake for this corner? Nahhh!!!" Unfortunately, you don't get something for nothing in this game and we'd just unknowingly overdrawn our account to the tune of 300 metres vertical, to be paid back immediately. The hills just seemed to keep going. And steep too. We walked a lot of them - pushing an avg. of 70 inches between us (not including nikcee who had the luxury of gears) we were only cranking up them at walking pace anyway. The heat was picking up too and a couple of us were forced to question our one-bidon strategy when we ran out of water. Gah! And then we finally reached Skyline Road which was much the same except without the bitumen. Steep winding rollers covered in loose gravel - take away the grippy bitumen and then even the downhills become a test of skill and nerve. We joked about racing each other down. Racing to see who could get gravel rash first. Turns out nikcee won that race. I rounded a tight downhill corner feathering the front brakes and skidding the back wheel to try to slow down when I came across Nick on the side of the road trying to twist his bars and levers back into shape, bleeding from various parts. Gah! I'll let him tell that story but I think we all had a taste of what it's like to be coming down a steep hill into a corner where the surface is so loose you can't apply enough braking force to slow yourself down. I felt a little bad around this point. I'd advertised the ride as a nice cruisy day on the trails and here we were, pushing our bikes up unridable hills in the hot sun, Nick had binned it into the dirt on his brand new Basso, Tom looked like he was bonking pretty hard and we weren't even half way yet! Anyway, despite the conditions, we all pushed on and there were no complaints. We could see Yarra Glen down in the valley now so we knew we weren't far away from food and drink. At one point we heard what sounded like radio controlled planes and gunfire. We had to push on, if only to find out what the hell sort of fun was going on down there without us. 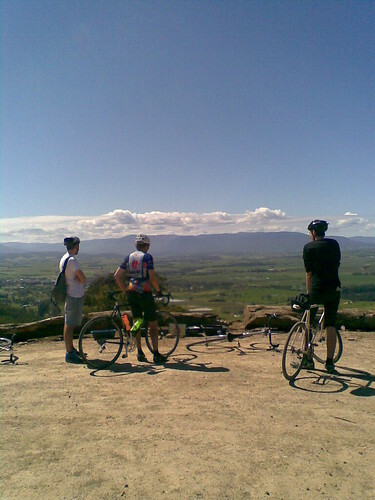 And then, at the top of a hill that we'd just pushed our bikes up, in a big clearing on a huge dirt mound, we reaped the rewards of taking the back roads - an awesome panoramic view of the Yarra Valley. The photos don't do it justice. We saw that the "radio-controlled planes" were para-gliders - about four of them buzzing around high above Lilydale airport (the gunfire was still going on but I don't think they were related.) And we saw a sweet eagle floating high and slow up above. Excellence. So, after we paused to enjoy the moment, we pushed on and soon found the Breakneck Road. Hm, as a shortcut it wasn't much chop. It was all rocky and bushy for a start - it's got "no thru road" signs all over it so it's pretty much a gnarly fire road. We hit what must have been one of the 20% sections and the surface was so loose and rocky and it was so steep that it was hard to actually walk down it without falling over, let alone ride. Down near the bottom of it Liam asked us all what could possibly make his bike (he was riding fixed, 23mm slicks) even less suitable for this terrain? Um, no brakes? Yep, all the vibration and whatnot had sheared the bolt on his brake lever which was now hanging from the cable, useless. Lucky we were almost at Yarra Glen! We stopped for food and drink at a bakery in Yarra Glen and Liam went to a hardware store and fixed up his brakes. It had taken us about four and a half hours to ride the 65km from Fed Square to Yarra Glen and we all decided that we didn't feel the need to go back the same way through all those hills. We decided to take the main roads back to Lilydale and then see how we felt. At least we'd have trains from then on if we wanted to pull the pin. Felt good to be on smooth relatively flat roads and we made good time. Lots of tourist traffic out there but we made it back to Lilydale without incident. Tom took off home from Lilydale and the rest of us pushed on up the Maroondah Hwy. A few hills between Lilydale and Ringwood but we were all travelling pretty well after our big lunch. Liam took off home at Mitcham and Nick and I kept rolling. Pretty soon it was fully urban traffic, splitting lanes and getting doors opened on us. We decided to finish it off properly and rolled right into Fed Square for a quick photo to mark the event and that was that.